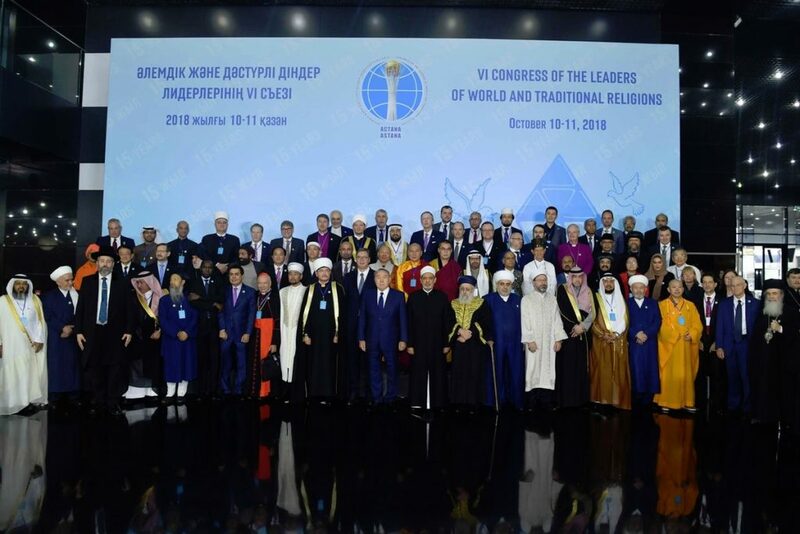 Eighty-two delegations from 46 countries representing the world’s religions gathered in Astana Oct. 10-11 for the Sixth Congress of Leaders of World and Traditional Religions. Its objectives are to seek universal guidelines among world and traditional religions and to be a permanent platform for international interfaith dialogue. 1. to promote in every possible way the involvement of the leaders of world and traditional religions in making greater efforts to achieve long-term stability and to prevent violent incidents caused by hatred and intolerance. 2. to strengthen cooperation of religious leaders with international institutions, Governments and public institutions as a key instrument for the successful implementation of vital recommendations and programs aimed at comprehensive security in the world. 3. to render every possible assistance to all societies and peoples, irrespective of race, religion, belief, language and gender, in ensuring the inalienable right to a peaceful life. 4. to respect equal rights and freedoms of all citizens regardless of racial, linguistic, religious, national, ethnic, social background, wealth, birth or other status, and act towards one another in the spirit of brotherhood. 5. to support initiatives seeking to promote interreligious and interfaith dialogue, which is a fundamental goal of the international community in its commitment to build a just and conflict-free world. 6. to express solidarity with all religious groups and ethnic communities that have suffered human rights abuses and violence by extremists and terrorists. 7. to support all efforts aimed at protecting refugees, their rights and dignity, as well as providing them with necessary assistance. 8. to call upon politicians and world media to renounce associating terrorism with any religion, as this is false and offensive to our religions and harmful to peaceful coexistence, which undermines mutual trust and cooperation within and among different religious communities. 9. to support all efforts aimed at preventing any attempt to fragment society on religious, racial or ethnic grounds. 10. to call upon religious leaders to promote the values ​​of peace, mutual understanding and respect in the media, social networks and public meetings. 11. to make every possible effort to prevent any provocation and violence in places of worship and holy sites of all religions, including Jerusalem, a holy city of all the Abrahamic religions. 12. to support institutions and initiatives that view interreligious and intercultural dialogue as an effective means to build a just, peaceful and responsible civil society. 13. to support the establishment of Nazarbayev Center for interfaith and intercivilizational dialogue in a recognition of outstanding contribution of the First President of the Republic of Kazakhstan to global efforts to foster peace and harmony. 14. to reject the misinterpretation of religious teachings and the defamation of religious values ​​as tools for spreading the ideology of extremist and terrorist organizations. 15. to encourage traditions of peace-building, strengthening of mutual understanding among the followers of world and traditional religions, and resolution of conflicts, existing in world and traditional religions, and to implement them in practice. 16. to promote among representatives of our religious communities the idea of ​​the necessity of peaceful coexistence among leaders of all faiths. 17. to facilitate and participate in implementing effective measures with regard to foreign terrorist fighters returning to their countries of origin as part of deradicalization and rehabilitation programs. 18. to promote interreligious dialogue, mutual respect and harmony at national, regional and international levels. 19. to facilitate rapprochement of different civilizations and religions as the cornerstone of human coexistence. 20. to assist States and political leaders in analyzing and exploring the root causes of religious extremism and international terrorism. 21. to call upon Governments to revitalize the work with the youth to prevent their radicalization. 22. to promote the recognition of appeals by prominent world religious leaders as the voice of wisdom. 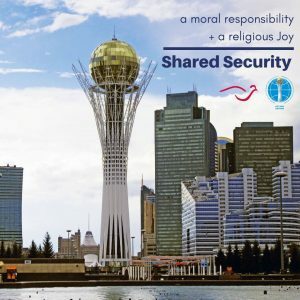 23. to convene VII Congress of the Leaders of World and Traditional Religions in 2021 in the city of Astana, the capital of the Republic of Kazakhstan. We appeal to all people of faith and of good will to be united during this difficult time and to assume their responsibility in ensuring peace and harmony on our planet.